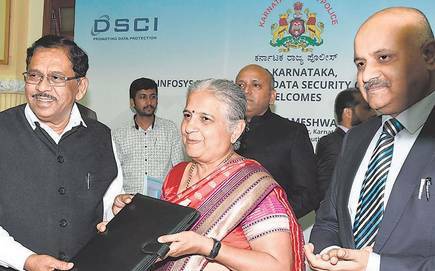 Infosys Foundation, the philanthropic arm of Infosys, has signed a Memorandum of Understanding (MoU) with the Karnataka Police to set up a Centre for Cybercrime Investigation Training & Research (CCITR) in Bengaluru and maintain it for five years. “The foundation will handle the capital investment for hardware, software and working capital requirements for conducting training programmes, conferences and digital forensic analysis. Technological infrastructure by providing specialised tools and incurring relevant licensing costs upgradation of the existing cyber lab for a period of five years,” she said. Along with Infosys Foundation, Data Security Council of India (DSCI), a premier industry body on data protection in India, also committed to making the cyberspace safe, secure and trusted by establishing best practices in cyber security and privacy. The Foundation has committed ₹22 crore to support building the centre that will house the CCITR through a public-private-partnership model. “DSCI continues its commitment to build the capacity of law enforcement in handling cybercrimes through our Cyber Forensics initiative. The Cybercrime investigation manuals developed by DSCI are acting as reference material for the police, prosecution and judiciary in handling cybercrimes,” she added.